Tired of using floss sticks or regular string? We cannot blame you. The entire process of flossing can be boring, repetitive and sometimes irritating. However, for the sake of your oral health, it needs to be done every day. This is where expanding floss comes in. This dental hygiene product has developed a lot of interest in recent years. It works on the same principle as the string that everyone is familiar with. The difference is that the floss grows thicker whenever it comes into contact with saliva or moisture in general. 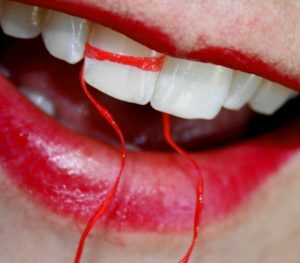 The friction created during flossing also helps the string expand. Getting the floss string glide smoothly between tight teeth spaces can be exasperating. The idea of the expanding floss is that it is thin enough to get in, and it does not become thicker until it is already between the teeth. The benefit of this is the ability to clean wider areas more thoroughly. Typically, people with crowded teeth have a hard time flossing. Many of them try switching to water flossing, but that does not address the issue of food residue stuck in the tight spaces between the teeth. Realistically, getting rid of that type of persistent and well-hidden plaque is best achieved by string floss. The problem with most strings, however, is twofold. They are either too thin and rip easily, or they are too thick and fail to fit between crowded teeth and the tight spaces between them. Furthermore, even if the thin cord does not rip, it is often not enough to cover larger surfaces. Either way, considerable areas of the mouth remain insufficiently cleaned. For this reason, manufacturers of floss that expands have expressly targeted that segment of people who are having a really difficult time getting the results they want with regular floss. This product is not designed only for people with crowded teeth. Dentists recommend flossing to everyone, especially in combination with brushing. It has been proven many times now that brushing your teeth is simply not enough. So, using this type of revolutionary cord to clean between the teeth can help reduce the likes of gingivitis, plaque and other teeth diseases, such as cavities. Experts and average Joes have praised expanding floss for its strong materials. Made out of expandable fibers, this type of string is less likely to break or rip. Do note, however, that just because the cord is sturdy it can be used more than once. Floss string should only be used once because bacteria remain on it after usage. Use once, and throw out! Using a proper flossing technique will help when using this product. There is some hard science when it comes to using string floss, but it is not rocket science. A simple Youtube video, or asking your dental hygienist can send you on the right track. Do not make the switch to expanding floss if you don’t know how to use regular floss. This is no miracle product. You should know the basics before spending more money on something that will collect dust in your bathroom cabinet. Cleaning your teeth incorrectly can hurt your gums. This can lead to bleeding, and sometimes gum disease. Especially if you cut your gum and bacteria finds its way inside. So, be extra careful.